Open 8:00 am to 8:00 pm or Dusk (whichever comes first) every day, except major holidays and in extreme weather. On July 30,2001, the 200 acre property north of 22 mile rd. and west of Ryan rd., was transferred to Shelby Township from the State of Michigan. 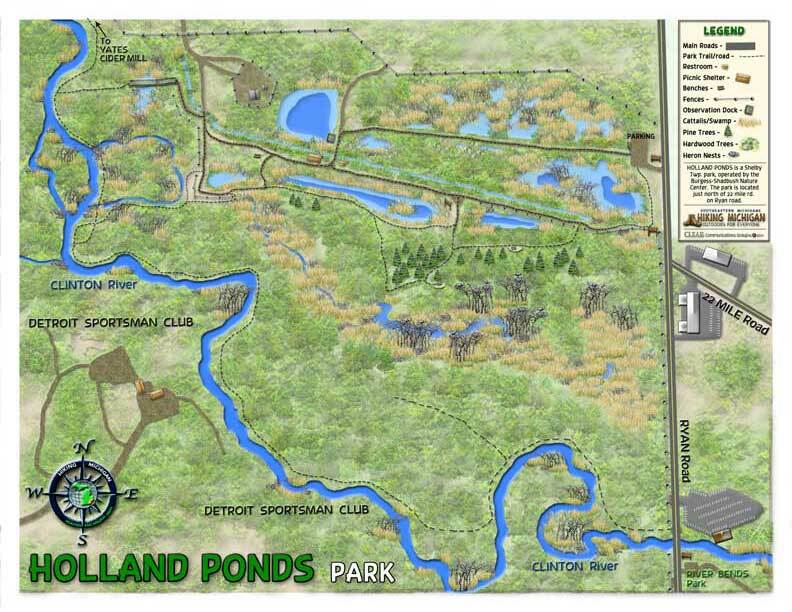 This new Shelby park, dedicated November 4, 2001, was named Holland Ponds to honor former Shelby assessor Don Holland. The marshland and woods provides a home to a variety of wildlife including deer, fox, blue heron, rabbits, geese, ducks, turtles, frogs and muskrat. The remains of an old building foundation, possibly from an earlier farm or outbuilding, are visible near the 22 mile road entrance. From the parking lot a trail leads west through marshland ending at two large ponds. A well defined section of the Clinton and Kalamazoo canal cuts through this area. A small shelter with picnic tables exists at the west end of the property. The park is home to the largest Great Blue Heron Rookery in Southeastern Michigan. With 39 successful nesting pair in 2011, and a total of 44 successful nests in 2012. This is a very delicate place. In 2012 there was a total of 50 nests at the very beginning of the season in March. A high wind storm came along and blew down trees and branches in both the front and rear heronries, destroying 6 nests instantly. With 2-4 possible fledged chicks per nest, that is a total of up to 24 new Herons lost in a moments notice. These successful Colonies of Great Blue Herons in the more populated areas of our state are rare places. The Great Blue Heron does not tolerate busy human activities, nor constant disruptions of their nesting sites, or food hunting areas. During the nesting season, after the eggs have hatched, it is a sunlight to sunset movement of both of the adults, to leave the nest and fetch fish and frogs for the quickly growing youngsters. Impeding this behaviour with interruptions or constant human activities will cause the adults to actually abandon the nest and youngsters. We hope the suggestions of installing a BIKE Pathway through the center of the Park, in cooperation with our own state DNR will never materialize, and these kinds of silly thoughts, of gambling with the possible future of this rare and the largest Great Blue Heron Rookery, will fade into the sunset where those kinds of onetime thinking ideas belong. 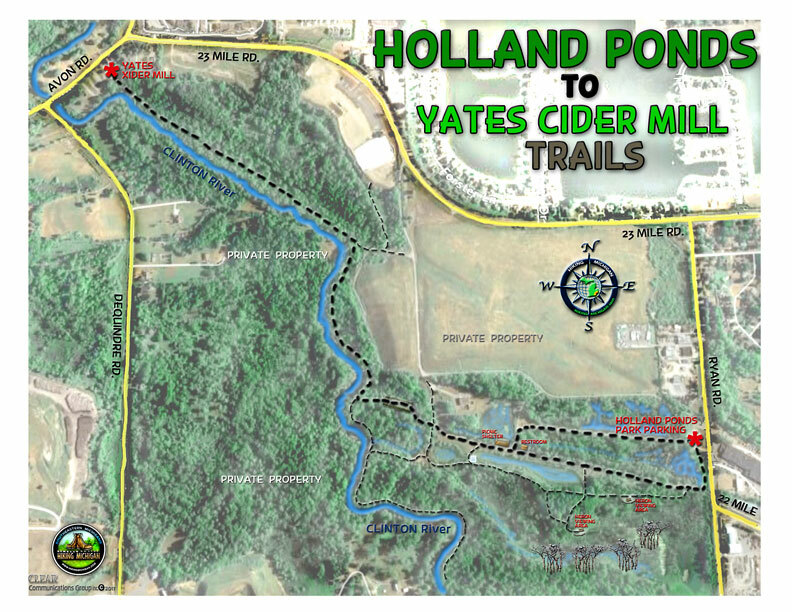 About 72 acres of the 200 acre site includes land that was the former Swiss Valley park (1921-1974) and also the 35 acre former Green Glen park (1924-1974). These two privately owned Clinton River parks were very popular with city dwellers looking for inexpensive weekend summer entertainment in the country. The popularity of these parks peaked from the prohibition era through the 1950’s. The parks offered picnic facilities, bars, music, and dance pavilions. Other activities included swimming and fishing in the uncontaminated Clinton River. Both park entrances were on the west side of Ryan Road and traffic jams were common at closing time. The two parks were later acquired by the Michigan DNR and closed to the public because of contamination leakage from the nearby landfill sites. Swiss Valley was located north on the Clinton River with Green Glen on the south side. The 37 acre Swiss Valley park property was sold to the DNR in 1974 by Ted Godzisz the owner for 38 years. The DNR tore down all the existing buildings on the property at that time. Green Glen, in addition to picnic facilities, boasted a ski jump built in 1937, and was used for one year by a Rochester ski club. A large sandy hill existed at the south end of Green Glen where motorcyclists would try their skill at hill climbing. Four toboggan runs were added to the site in 1940. In 1943 an eight lane bowling alley was built on the property complete with inside bar and kitchen. Shortly after WW2, three bridges were constructed over the Clinton River to connect Swiss Valley, Green Glen, and the adjacent Warsaw Park. It’s estimated that the combined three parks at times drew as many as 12,000 to 15,000 people for one day. The old Clinton River park property has returned back to ShelbyTownship for all to appreciate again. This valuable land is now preserved for future generations to enjoy. This parkland has an interesting past. About 128 acres of the site was undeveloped recreation land owned by the Huron Clinton Metropolitan Authority that was closed to the public because of contamination from the adjacent former G&H landfill company (1957-1974). The now open Holland Ponds section occupies part of the former Huron Clinton Parkland. The remaining acreage is undeveloped at this time, and is owned by Shelby Twp. Parks & Recreation. The EPA is maintaining the water purification plant on the site to ensure the high quality of groundwater. A short Slide-show of some of the critters and things you may encounter on a journey to Holland Ponds park. All the Historical events & places in Shelby Twp. Story of the Underground Railroad in Shelby Twp.